Darpan Magazine recently ran a feature on SmileTown Dentistry. Our dentists, Dr. Kanani and Dr. Chadha talked about the importance of positive early dental experiences for children, and their focus on serving Langley's South Asian community. Darpan Magazine is a South Asian media pioneer, and has been a leader in the Canadian market since 2004. Darpan offers readers diverse, lifestyle-based features, as well as meaningful, thought-provoking and engaging editorial pieces. 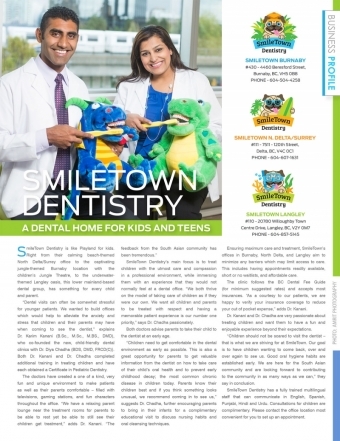 SmileTown Dentistry was honoured with a feature in this excellent publication recently. Dr. Karim Kanani and Dr. Diya Chadha were given an opportunity to talk about the vision and mission behind our practice, and their passion for their work as children's dentists. Both emphasized Smile Town's focus on providing quality, child-friendly dental care, and on making significant, positive contributions to Langley's South Asian community. Children should not be scared to visit the dentist – that is what we are striving for at SmileTown. Our goal is to have children wanting to come back, over and over again to see us. Good oral hygiene habits are established early. We are here for the South Asian community and are looking forward to contributing to the community in as many ways as we can."